George Michael should hire a chauffeur whenever he goes on a cannabis run. He was arrested on suspicion of being unfit to drive under the influence of drugs, but posted bail yesterday. 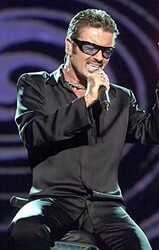 The singer was found in a half-conscious state slumped in his Mercedes at traffic lights in North London. George was given a warning for possessing a small amount of cannabis. ( In the UK, cannabis is a Class C drug. ) He has been found asleep in his car in three separate incidents this year. So all of you guys who think that you can drive OK when you're stoned, think again. You've got to love English humour. Now George can get back to his World Tour.